SUITABLE FOR DESCALING KETTLES,WASHING MACHINES,IRONS,DISHWASHERS,BABY BOTTLE STERILISERS AND COFFEE MACHINES. 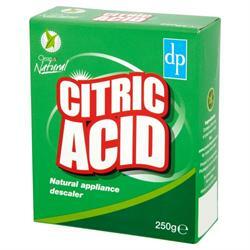 No related products for the CITRIC ACID 250G . No key features selected for the CITRIC ACID 250G . No quantity discount for the CITRIC ACID 250G . Be the first to submit a review for the CITRIC ACID 250G .